Over the last two weeks, a large number of new Gundam Side Stories DLC has been released by Bandai Namco. Last week saw the release of the RGM-79N GM Custom and RGC-83 GM Cannon II . Both first appearing in the Mobile Suit Gundam 0083: Stardust Memories OVA, they are available for 300 yen each. Along with these two mobile suits, VR Mission 107 was released free of charge. This week saw the release of the EMS-10 Zudah . Initially appearing in the MS Igloo CGI OVA, the Zudah is a Zeon mobile suit devised as part of an extensive Zeon propaganda campaign. The Zudah was described as the new “secret weapons” that would demolish the Federation’s famed Gundam and lead Zeon to victory. The Zudah is now available on the Japanese PlayStation Store for 400 yen. Along with this new mobile suit, this week’s update includes VR Mission 108 as a free download. In addition to the weekly DLC, Bandai Namco has partnered with Kadokawa Comics to release a Full-Armor Variant of the Slave Wraith. First appearing in the Missing Link campaign, the RX-79[G] SW Slave Wraith is a custom ground mobile suit. The Full Armor variation of this unit has increased defensive capabilities, providing extra protection against the light weapons used by Zeon’s mobile suits through shock absorption. Released on August 26th in Japan for 580 yen, the first volume of the Mobile Suit Gundam Side Stories manga includes a DLC code for this new unit. 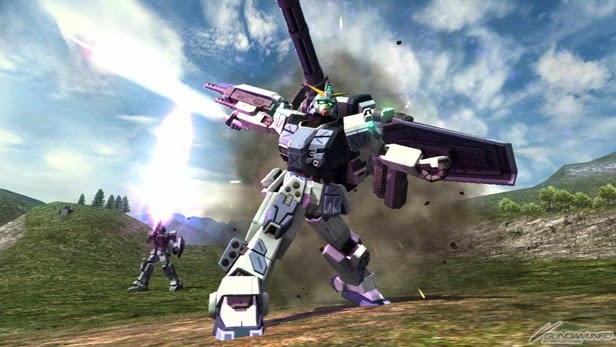 Like clockwork, Bandai Namco has graced us with their weekly round of Gundam Side Stories DLC. This week we visit UC 0080 with the RX-78NT-1 Gundam “Alex” and the MS-18E Kämpfer. A prototype Federation mobile suit specifically developed for Newtypes, the Alex first appeared in the 1989 OVA Mobile Suit Gundam 0080: War in the Pocket under the control of test pilot Christina Mackenzie. Also making it’s first appearance in War in the Pocket, the Kämpfer is a Zeon mobile suit designed for fast and efficient combat. The Kämpfer took on the Alex in 0080 but fell prey to it’s wrist gattling cannon. Both suits are now available on the Japanese PlayStation Store for 400 yen each. 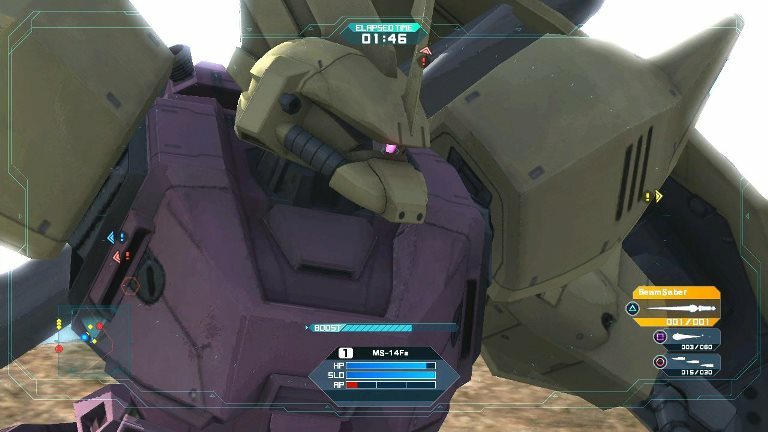 In addition to the new mobile suits, this week’s update includes VR Mission 106, which is free to download. It is a ground-based mission that incorporates the Alex as an enemy if purchased. Another week, another wave of Gundam Side Stories DLC, this time it being the RX-81 LA G-Line Light Armor. A variant of the RX-81 G-Line series, it made it’s first appearance in Kunio Okawara’s Missing Mobile Suit Variations. 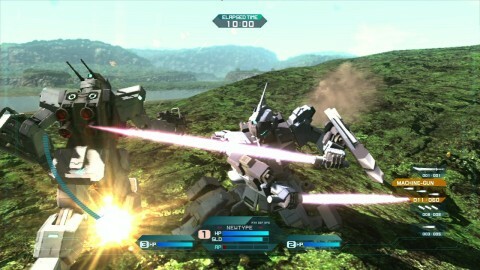 The Light Armor RX-81 saw a redesign by Katoki Hajime for the 2009 PS3 title Mobile Suit Gundam Battlefield Record U.C. 0081. In U.C. 0081, the RX-81LA G-Line Light Armor was assigned to the Earth Federation Forces’s Phantom Sweep Team as a means to combat the Invincible Knights Zeon remnants. Now available on the Japanese PlayStation Store, the G-Line LA can be yours for the low low price of 300 yen. 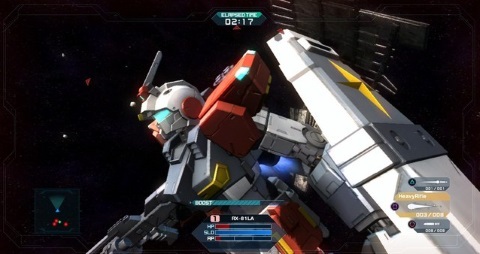 This mobile suit is playable in both ground and space based missions. It should be noted, however, that this week’s update does not include any new VR Missions, but we know that they’re coming based on the information provided in the Famitsu Visual Complete Guide. Following on the heels of our report detailing future DLC courtesy of the Famitsu Visual Complete Guide, new downloadable content has been released today via the Japanese Playstation Store for Gundam Side Stories. Although it appears to be another reskin, the MG-14 Fs Gelgoog M Commander from Mobile Suit Gundam 0083 Stardust Memory is now available for 400 yen. In addition, VR Mission 105 is also available for free. Mission 105 is a ground based scenario taking place in the ruins of a war-ravaged city. 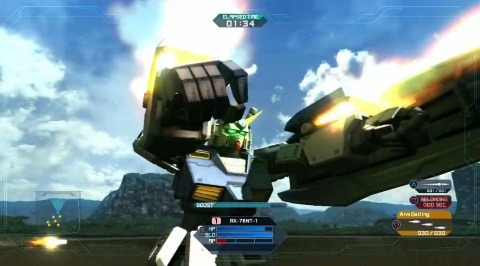 If Bandai Namco continues this trend, we should see VR Missions 106-108 along with the Zudah, G-Line Armor, Gundam Alex, Kampfer, GM Custom and GM Cannon II in the near future. In a move that would shock no one in Gundam fandom, the newly released Famitsu Visual Complete Guide for Gundam Side Stories lists multiple unannounced DLC mobile suits and VR missions that will likely be the final waves of new content. The previously unknown mobile suits are: G-Line Light Armor (Battlefield Record UC 0081), Gundam Alex (War in the Pocket), Kampfer (War in the Pocket), Zudah (MS IGLOO), GM Custom (Stardust Memory), GM Cannon II (Stardust Memory), Gelgoog Marine (Stardust Memory). In addition to the above mobile suits, VR Missions 105-108 are outlined in the Visual Complete Guide. No release date or pricing information is provided for the new content at this time.